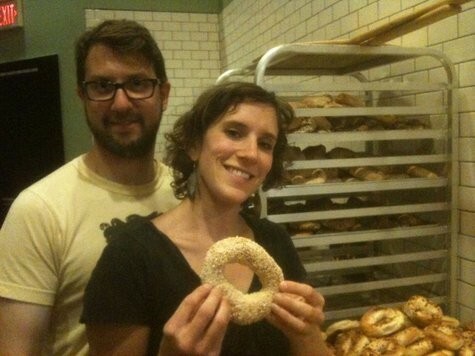 Last month I fell in love with bagels from Beauty’s Bagel Shop, a weekend venture by Oakland residents (and couple) Blake Joffe and Amy Remsen. Joffe’s a cook at Delfina in San Francisco, Remsen a server at Addie’s Pizza Pie on this side of the bay, same place they make the bagels after hours on Fridays. The couple sell Montreal-style bagels (boiled, then baked in a wood-fired oven) to Wise Sons, the Saturday S.F. popup deli (they also help out in the kitchen), also to Saul’s in Berkeley (again, Saturdays only). And last Sunday, Joffe and Remsen debuted a weekly stall at the Kensington Farmers’ Market (Colusa Circle and Oak View Ave., Sundays from 10 a.m. to 2 p.m.). They're also in negotiations for their own shop in North Oakland. I spoke with Joffe by phone recently to get the Beauty’s backstory, hints about the Oakland brick-and-mortar, and to find out: Why Montreal? WTF: Tell me about Montreal. Did you grow up there? Joffe: No, I grew up in Philadelphia — my father is from Montreal. He moved there when he was 4, from Palestine, and then moved to Israel when he was 26, met my mom, and they moved to Philly. I took a few trips up to Montreal when I was a kid. It’s amazing — people don’t really think of Montreal as a Jewish city, but there’s tons of Jews there. At the turn of the last century Jews from Europe either went to New York or Montreal. Whenever my family would go to Montreal, my dad liked to go to Fairmount Bagel. Like, every day. Blake Joffe and Amy Remsen. WTF: What made an impression on you? Joffe: I just remember my dad’s excitement, and obviously my own excitement. You walk in and it’s just a counter. On the right side are tons of bagels in bags and a refrigerator with some shmears, and everybody is working behind the counter. I remember the oven being this monster of an oven, this brick oven — it seemed like it was caving in, that’s how old it was. I just remember watching the baker pulling the bagels out and throwing them into this big trough, and the smell, and eating a hot bagel out of the oven covered in sesame seeds. WTF: What’s up with the Oakland shop? Are you just planning to sell bagels, or are you thinking about doing an actual deli? Joffe: We’re not going for the whole deli thing, but we are going to do smoked fish and chopped liver. Every now and then matzo ball soup, maybe once a week — we just want to serve good food. WTF: How’d you come up with the name Beauty’s? Joffe: Beauty’s, it’s an old diner in Montreal — I think it’s been around since, like, the Fifties, maybe the Forties. Anyway, my dad loved it. It’s just a cool old diner that celebrities go to — you can get Montreal-style bagels with smoked salmon and eggs. It’s just a warm, inviting place, and that’s the feeling that we want to have as well. And since it is such a landmark in Montreal, it seemed like a good way to pay homage. WTF: Why did you guys decide to focus on bagels? Joffe: We moved out here a little over two years ago, from Philadelphia. I started at Delfina right away, first day I moved here. Matt [Matthew Gandin], the chef de cuisine there, is Jewish. I said, “Hey Matt, where can I get a good bagel in the Bay Area?” and he said, “Pah, there aren’t any.” I thought, This is a culinary mecca, there’s got to be bagels here, but he was right. Amy and I are passionate about food and service but we didn’t want to open a restaurant. We wanted something a little more nostalgic and casual and comfortable. Anyway — we thought, What about opening a bagel shop? Then we thought, There’s no Montreal-style bagel shops here. If we’re going to do it, let’s really do it and make a splash and give the Bay Area something they’ve never seen before. WTF: This is something you guys have been planning for from the time you got here? Joffe: Pretty much right away. I became a sous chef at [Pizzeria Delfina] specifically to learn how to work with dough. That has helped me for sure. WTF: When did you first start experimenting with Montreal bagels? Joffe: Maybe eight or nine months ago. We made them at the pizzeria (Delfina). We shared them with the people there and had good response, though they’ve really transformed since then — I’m just remembering that first batch! [Delfina owner] Craig Stoll is great, he’s very supportive of what we’re doing — he’s been advising us on things. He’s Jewish, but not only that, he was in this position we’re sort of in now when he was trying to start Delfina. WTF: But now you’re making them at Addie’s Pizza Pie in Berkeley? Joffe: Yeah, on Friday nights — we’re there from 10:30 to about 3:30 in the morning. WTF: And then you work at the Wise Sons popup on Saturday mornings? You must get no sleep! Joffe: It’s a long two days — we get between two and three hours of sleep on Friday night. We just got our first employee, Mike Fikaris. Unbeknownst to him, I’m training him to be my top bagel guy. WTF: How'd you learn the process? Joffe: We did book and Internet research. We’ve reached out to the Montreal bagel shops, but they’re not really forthcoming with information, though I did apprentice at St-Viateur. It’s the biggest Montreal bagel shop, a chain — I think they have, like, six of them. I did one week there, which they were all kind of laughing at me for. They were, like: “A week! You think you’re going to pick this up in a week?” I said, “Don’t worry about me.” But they ended up being really surprised. I have nineteen years of food experience behind me. I did just fine.